COVER: Don Stern, director of the American Contract Bridge League, is a leading authority on Backgammon, an enthusiastic and successful player, teacher and tournament organiser. His direct, uncomplicated approach leads swiftly and easily through the basics of play and on to the intriguing complexities of advanced strategy, tactics, betting and winning! Each easy step is a ccompanied by quizzes and diagrams, sample moves and games, and guides to the odds and probability of each throw, designed to reinforce the lessons, tests the reader's progress and provide an invaluable and immediate source of information. for the beginner and the expert. 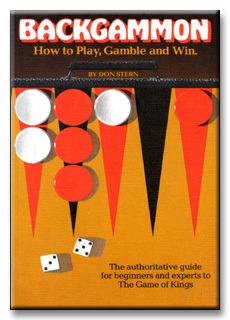 Other Backgammon books explain the rules and theory of the game: Don Stern explains the competitive strategy and psychology of the game and how to win and keep improving the suspense, excitement and skill of your game as you keep winning against more advanced opponents. Backgammon, one of the most ancient boardgames known to man, has achieved today an ever increasing cult-like popularity. Known for over 5,000 years as The Game of Kings and the King of Games, it is still probably the world's fastest moving game of skill and chance. Why? It demands the mental ability of a chess player, the betting skill of a poker player and the gambling instinct of a roulette player. No two backgammon games are identical. Ties are impossible. Luck and skill alternate with breathtaking speed and with one roll of dice the player can tumble his opponent from the heights of a winning position to total defeat. The tide of battle in one game can shift a dozen times in as many throws of the dice. It takes no more than five minutes to learn the basics of the game and is as exciting for the beginner, faced with the challenge of innumerable intricacies, possibilities and variations of play, as it is for the professional who has spent many years learning the game and stakes thousands on the roll of the dice and five minutes play.